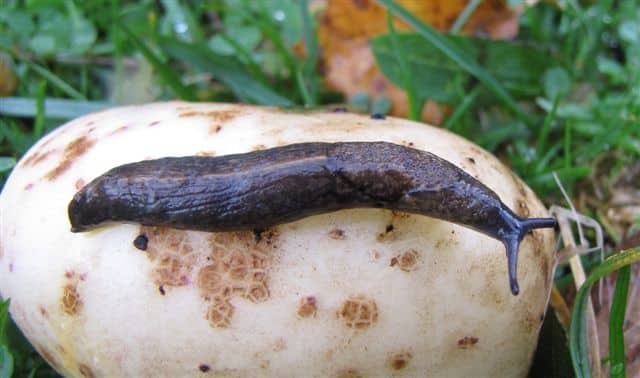 Slugs are not everybody’s favourite animals, being slimy and, at times, serious pests of both ornamental and crop plants. They have had a limited appeal even for naturalists, since there are nearly 50 native forms and their identification has been, and remains in some cases, difficult. However, the publication in 2014 of a new AIDGAP key to the group (see below), copiously illustrated in colour, has made them slightly more manageable. On 8th October, Pat brought me, from our garden at Nedd (NC137319), a distinctive-looking specimen. It was a little over an inch long, with a dark brown mottled body and a yellow-orange keel, which extended from the rear of the mantle back to the end of the sharply cut-off tail (see photograph). Its sole was, characteristically, pale at the sides and dark in the centre. Using the new key, I was able to confidently identify it as a Budapest Keeled Slug Tandonia budapestensis, which does not appear to have been previously recorded from the west coast of the mainland north of Skye. There is a record from the Durness area and then a gap until near the Caithness border, with no records so far from central parts of Sutherland (probably because no-one has looked). This species was originally native to the southern Alps and northern Balkans (hence its name), but has been established in Britain since the 1920s. It is widespread in lowland areas and commonest in disturbed habitats, where it may be a serious pest of potatoes, root crops and bulbs (and is perhaps responsible for much of the damage to our own potatoes). One of the reasons for its success may be that it is toxic to carabid ground beetles that regularly feed on other slugs. Slugs of Britain and Ireland. Identification, understanding and control, by Ben Rowson, James Turner, Roy Anderson and Bill Symondson, was published in 2014 by the Field Studies Council. Apart from the well-illustrated keys and species accounts, it contains an excellent introduction to the biology of the group.